If you own Gionee A1 Plus, please do leave your feedback too. 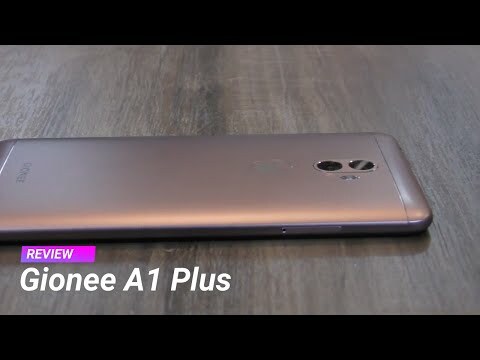 Lowest price of Gionee A1 Plus price in India starts at Rs. 10,980 Gionee A1 Plus is available on Flipkart at Rs. 10,980 and on Amazon at Rs. 10,999. Prices updated on 25th April 2019. The feature-packed Gionee A1 Plus is here for those who want beautiful selfies and need a super battery. Check out its other features here. The Gionee A1 Plus comes with a large 6-inch IPS LCD display sporting full HD resolution and a 367 PPI pixel density. The phone has a rear-mounted fingerprint scanner and the display is protected by Corning Gorilla Glass 3. It is available in two main colours; grey and mocha gold. There's a 20 MP f/2.0 front camera for selfies and portraits. The primary camera setup stars two cameras with 13 MP f/.20 lens, a 5 MP depth lens and LED flash. Other features include HDR and Bokeh mode. The engine room is fitted with a powerful Mediatek MT6757T Helio P25 chipset. The chipset has four 2.5 GHz Cortex-A53 processors & four 1.4 GHz Cortex-A53 cores. The A1 Plus has 64 GB internal storage (which is expandable up to 256 GB) and a 4 GB RAM for a lag-free experience. Gionee promises a super battery backup and it does not disappoint. The phone is powered by a massive 4550mAh battery that can last up to 510 hours on standby. There’s Bluetooth, Wi-Fi, Hotspot, 4G LTE, 3G, 2G for connectivity and the phone also supports USB C type for fast charging. The A1 Plus comes with Gionee’s Amigo OS built on Android 7.0 Nougat.